Brouwerij 3 Fonteinen was founded in Beersel, Belgium in 1887. Armond de Belder took over operations from his father in 1982 and continues to run the family brewery. 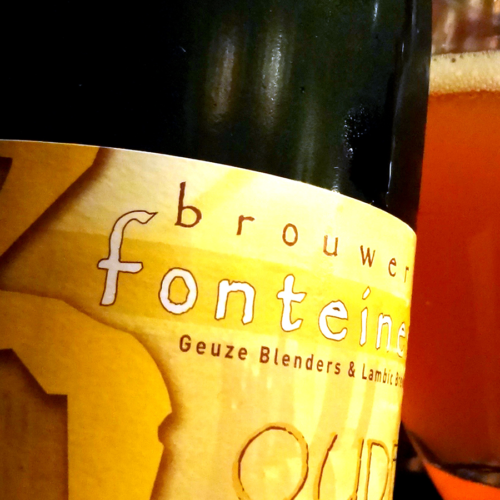 Drie Fonteinen blends their own Lambic to create its legendary Geuze, but also buys Lambic from nearby brewers like Boon for additional blending. Drie Fonteinen Oude Geuze is tart, earthy, and incredibly complex, but also spritzy as Champagne and greatly refreshing. Drie Fonteinen is one of the few remaining traditional geuze blender in Belgium, using only 100% spontaneously fermented lambic beer, aged in oak casks, with no artificial sweeteners or other additives. Geuze is a blend of 1, 2 and 3 year-old Lambics aged in oak barrels and foeders. A light-bodied, highly carbonated, with a crisp, tart finish. Carefully blended by hand, the character of the finished Geuze is complex, sour and delicious. The Armand & Gaston variant is Drie Fonteinen’s most special versions of its Oude Geuze, a blend of Drie Fonteinen brewed lambic from 2013, 2014 and 2015.